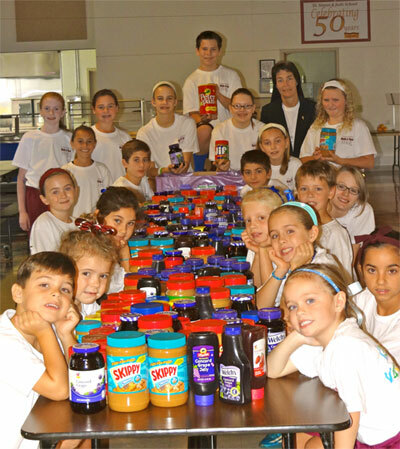 More than 500 jars of peanut butter and jelly were collected thanks to the generosity of SS. Simon and Jude Parish community in West Chester, including school students, students in the PREP (Parish Religious Education Program) and parishioners. The jars will be distributed to needy families through archdiocesan Nutritional Development Services’ Community Food Program. Shown in the photo with some of the collected food are, left side front to back: Alex Olivo, Nora Bailer, Riley Carr, Alex Datz, Cole Soster, Ava Panetta, Maddie Gannon, Alison Tegler and Sophia Lebano. Right side front to back are Morgan Palotas, Sophia Gueriera, Sydney Jordan, Kiley DelFra, Tommy Manning, Kayla Wadyko, Joe Magnotta, Eily Wilt, Erin Kirk, Sister Barbara Jude, I.H.M., director of religious education; Grace McLaughlin and Ryan McFillin.